The National Instruments PXI-4072 FlexDMM gives you the functionality of three common instruments in a single-slot 3U PXI module -- a 6½-digit multimeter, an LCR meter, and a 1.8 MS/s isolated digitizer. The NI PXI-4072 FlexDMM brings digital multimeters one step closer to providing universal measurement capability by offering you the 20 most common ATE measurements, including voltage, current, capacitance, inductance, temperature, and resistance. By integrating these measurements into one PXI module, you can reduce test system size and cost, increase throughput, and shorten test development time. The PXI-4072 can also be used with PXI switches to form a multichannel data acquisition system. The PXI-2527 64-channel, 300 V multiplexer offers a low thermal EMF solution for both high and low voltage measurements. The PXI-2530 128-channel reed relay multiplexer offers more density for higher channel count systems and better performance for low-current switching. For additional switch configurations, visit the PXI Switches link in the Resources section. 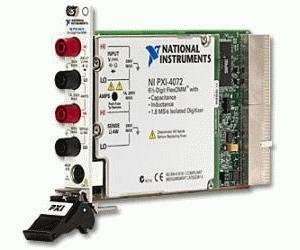 The National Instruments PXI-4022 is a PXI accessory module consisting of a high-speed, high-precision amplifier that conditions signals for acquisition. With the guarding functionality, you can make 6-wire resistance or capacitance measurements for components connected in parallel on complex printed circuit board layouts or cable test applications. For low-current measurements, the NI PXI-4022 amplifier and high-precision resistors create a feedback current amplifier. This implementation minimizes burden voltages and converts current to voltage, so you can measure picoampere signals with femtoampere noise.